Filmmaker Mónica Savirón shares a selection of works by artists who have raised unique and distinctive voices in Latin America’s avant-garde cinema. From influential feminist film pioneer Narcisa Hirsch to the contemporary celluloid-based portraits of Azucena Losana, ACCENTS provides a kaleidoscopic, intersectional, and multi-lingual approach to cinema. Just as in the work of poet and activist Victoria Santa Cruz, also included in the program, these films connect to ideas of racial and gender equality, memory, and people’s revolution. Screening super-8mm and 16mm films on video, from 1975 to 2018. Presenting work by Valentina Alvarado, Annalisa D. Quagliata, Narcisa Hirsch, Victoria Santa Cruz, Paz Encina, Azucena Losana, Adriana Vila Guevara, and Mónica Savirón. (55 min) Mónica Savirón in attendance! “Starting from a series of thoughts on the territory, while defining or blurring the borders and terms like traveling and return, I started to film postcards, flashes and/ or blinks of metaphors. These are associations or links that I have with my place of origin, exploring the phenomenon of moving from one place to another, the itinerancies, the hybridization of artistic languages or geographical spaces. The images, filmed in Venezuela and Spain, belong to a brief essay of these round trips where I search for a tension built on the idea of being native and foreign; of living in one place and simultaneously identifying with a different cultural background. I built a topography of the memory where family space, the longing for the homeland, and the reconstruction of new geographies are involved. The result is a personal geography of utopias and affections.” – Valentina Alvarado. “Closer to Our Time is a found footage film that utilizes images from the documentary El Grito (The Scream, Leobardo López Arretche, 1968). The student movement of 1968 in Mexico ended with a State crime that has gone unpunished until this day. The degraded images of the film refer to the old wounds that are still open—the past defining and reaffirming the increasing violence and impunity in the country.” – Annalisa D. Quagliata. “Through an amber filter, the camera’s lens approaches the pampas, grasslands, and the faces of natives from the southern end of South America. Photo transparencies and the only soundtrack of the strong, free winds from the area, fading in and out, speak to the stories and mysteries of the region.” – Narcisa Hirsch. Part of the touring museum exhibition, “Radical Women: Latin American Art, 1960-1985”, They Shouted Black at Me documents Santa Cruz’s performance in the recording Victoria—Black and Woman, by theater director Torgeir Wethal. Santa Cruz recites a memory of her girlhood experience of racial discrimination, and the empowerment that came from embracing her blackness. Shouting and repeating confrontational words in Spanish to the rhythm of drums and of her clapping hands, Santa Cruz transcends the imposed devaluation of Afro-Latinos, and transforms situations of oppression into power. A rich, multi-layered track of sounds from the exterior world at night comfort the memories in the character’s mind; the subtitles of the film, I Knew You Were Sad, are a dialogue that comes from the past to fill the absences of the present. In the center of the frame, the glass that covers the portrait of an unidentified man and a child mirrors the outside’s moving lights and the summer storm. “São Paulo is the biggest, most populated, and dizziest city in South America. Cariocas and Paolistas, always in a hurry between point A and B, look like tropical birds and frenetic ants in the city’s great distances. This film is a busy journey through a beautiful Brazilian beast that cannot help but continuing moving at the rhythm of irregular beats.” – Azucena Losana. Hirsch reads fragments from Borges’s work, her voice fading into silence before the sentences end. “I saw the populous sea, saw dawn and dusk, saw the multitudes of the Americas, saw a silvery spider-web at the center of a black pyramid, saw a broken labyrinth (it was London), saw endless eyes, all very close, studying themselves in me as though in a mirror, saw all the mirrors on the planet (and none of them reflecting me), saw in a rear courtyard on Calle Soler the same tiles I'd seen twenty years before in the entryway of a house in Fray Bentos, saw clusters of grapes, snow, tobacco, veins of metal, water vapor, saw convex equatorial deserts and their every grain of sand, saw a woman in Inverness whom I shall never forget, saw her violent hair, her haughty body, saw a cancer in her breast, saw a circle of dry soil within a sidewalk where there had once been a tree, […] saw simultaneous night and day, […] saw the oblique shadows of ferns on the floor of a greenhouse, saw tigers, pistons, bisons, tides, and armies, saw all the ants on earth, saw a Persian astrolabe, saw in a desk drawer (and the handwriting made me tremble) obscene, incredible, detailed letters that Beatriz had sent Carlos Argentino, […] saw the circulation of my dark blood, saw the coils and springs of love and the alterations of death, saw the Aleph from everywhere at once, […] saw my face and my viscera, saw your face, and I felt dizzy, and I wept, because my eyes had seen that secret, hypothetical object whose name has been usurped by men but which no man has ever truly looked upon: the inconceivable universe.“ – from Jorge Luis Borges’s El Aleph, 1945. For this film, Losana performs live audio equalization. The artist altered the levels of sound to emulate the flutter of a hummingbird from a found, silent film. 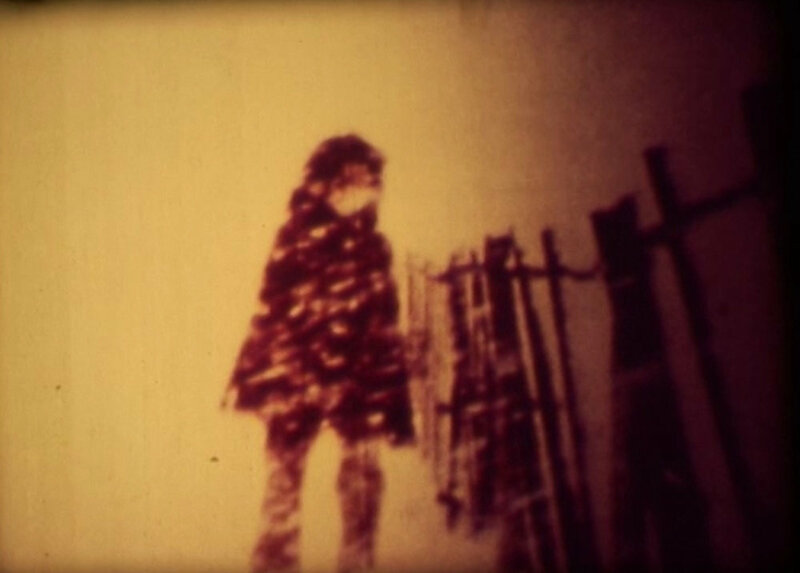 The sound is provoked by contact microphones attached to the projector running the film at a speed of 5 frames-per-second to show the degradation of the celluloid in detail. “Contrary to the standardization of a single hegemonic point of view, the center in the tropics is not the whole, but the starting point of a powerful range of visions. Inspired by Olafur Eliasson’s optical device, Viewing Machine (2003), Intertropical Vision is a trip into the core of Brazilian rainforest’s multiple, indomitable condition.” – Adriana Vila Guevara. Broken Tongue is an ode to the freedom of movement, association, and expression. It pays homage to the diaspora of the different waves of migration, and challenges the way we represent our narratives. It is a search for a renewed consciousness, for reinvention, a “what if”, the formal equivalent of asking a question expressed with a broken tongue—or not so broken after all. Mainly made with images from the January 1st issues of The New York Times since its beginning in 1851 to 2013, Broken Tongue is a heartfelt tribute to avant-garde sound performer Tracie Morris and to her poem Afrika. With many thanks to Daniela Muttis, Jacqueline Wood, Andrés Denegri, Michael Gott, OTA – Odin Teatret Archives, University of Cincinnati, The Mini, and all the participating artists. Friday, October 26th, 2018 (12:00 PM) @ the University of Cincinnati - Old Chemistry Building (Room 701) (2855 Campus Way, Cincinnati OH 45221).